Linnaeus University is one of Sweden’s newest higher education institutions, founded in 2010 through a merger by the former Kalmar and Växjö universities in the South Swedish province of Småland, with campuses located in both cities. The university has established a research group for a sustainable built environment in its department of Built Environment and Energy Technology which conducts cutting-edge research linked to sustainable development and to the implementation of innovative solutions in the fields of bioenergy, building construction, energy efficiency, and forestry. Linnaeus University is the only research institution which has joined INNOVATE as a learning partner and for this purpose has obtained funding from the Kamprad Family Foundation in order to develop a One-Stop-Shop for energy renovations of single-family houses. For the project the university cooperates closely with the municipality of Växjö, which refers to itself as the “Greenest City in Europe” – a title that has recently been certified when Växjö received the European Green Leaf Award 2018 for its commitment to generating green growth. Generally speaking the Swedish population is well known to have a high level of awareness regarding environmental issues resulting in a very positive attitude towards actions targeting climate change mitigation and sustainability. However, when conducting research in preparation for the INNOVATE project, Linnaeus University realized that while most Swedes engage in habitual or low cost measures of mitigation, many will be less willing to invest into more intensive and costly measures – including energy refurbishments. In addition, there are currently no strong financial incentives for Swedish households to seek out opportunities for energy savings, as energy costs in Sweden are not very high, representing for most households no more than 3-5% of their overall income. This may help explain why the deep renovation in Sweden is in a very primitive stage, with a large fragmentation between small companies that do not coordinate their work, and why renovation of individual houses has only progressed around 1.2-1.8% in the ten years between 2001 and 2011. 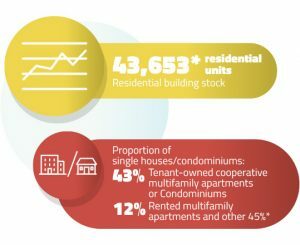 Nevertheless, the Swedish building stock represents an important potential for energy efficiency and the renovation of two thirds of Swedish buildings is required by 2050 in order to achieve Sweden’s climate objectives. This is also the case in the county of Kronoberg – to which the municipality of Växjö belongs – where 79% of houses were constructed before 1980 and are in need of deep renovation. 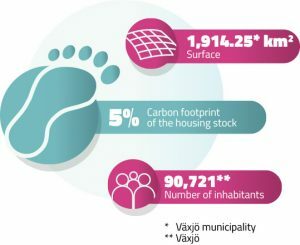 Houses with electric heating systems, present in around a quarter of all houses in Växjö, have particularly important energy saving potentials, with achievable reductions of primary energy use at around 70-80% when replaced with biomass-based district heating or ground source heat pumps. These reflections have led Linnaeus University to designate individual houses built between 1960 and 1980 and which have electric heating systems as their primary target group to be renovated through INNOVATE’s One-Stop-Shop model. 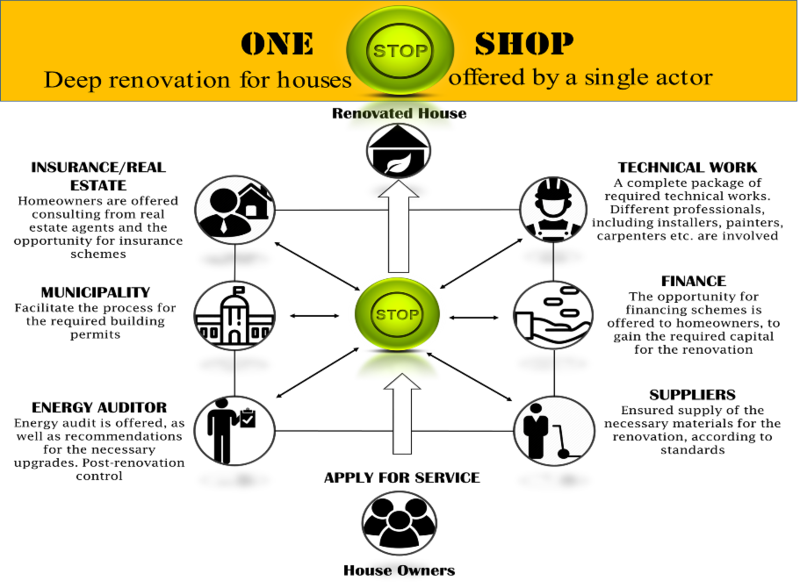 The development of holistic One-Stop-Shop services is highly relevant for the Swedish renovation market where the construction sector is dominated by very small companies with less than four employees focused solely on individual steps of the renovation, resulting in a piecemeal approach for homeowners. As Sweden currently lacks regulations which guarantee the overall performance of an integrated renovation, trust in the construction sector is low and it is the homeowner who must coordinate several companies at once and take all the risks and responsibilities concerning quality assurance of the works. While a small number of companies have the capacities to offer complete renovations, the present construction boom in Sweden has fixed their attention on new constructions so that they have no incentive to develop such a comprehensive renovation service for energy efficiency on their own. Financing of such retrofits is also a significant challenge, especially for young homeowners under 36 years of age who are most likely and willing to undertake deep refurbishments when buying a house – as they will probably live there for several years at least. The most cost efficient option to finance energy efficiency renovations of single-family houses is mortgage refinancing. However, young families use up the low interest bearing housing loan to buy the property and then have big difficulties finding additional financing at attractive interest rates for renovations. Many of these challenges can be addressed through the development of a One-Stop-Shop providing comprehensive services including advice, financing options, and quality assurance, which is exactly the model Linnaeus University and its local partners are seeking to develop. One such local partner is the installation company Åseda Värme och Sanitet AB specialized in the installation of heat pumps, ventilation systems and all types of piping and drainage systems. The company is ready to use its competencies to help develop and test the One-Stop-Shop model and to sub-contract other local companies for services it cannot provide itself. It is the municipality of Växjö that will provide an energy advisor to accompany and monitor the works carried out by Åseda Värme och Sanitet. In order to get more businesses and craftsmen involved into the process and to build capacities in the region, Linnaeus University is also designing training modules on the coordination and management of renovation projects under a One-Stop-Shop model. Additionally, the university has also committed itself to launch a communication campaign to raise awareness in the Swedish population and to promote its One-Stop-Shop concept. Due to its specific nature as an academic institution, Linnaeus University notably includes conference papers and popular science articles as part of its communications strategy towards stakeholders. The university is also in the process of consulting with several Swedish banks in order to find innovative financing solutions for energy efficiency.